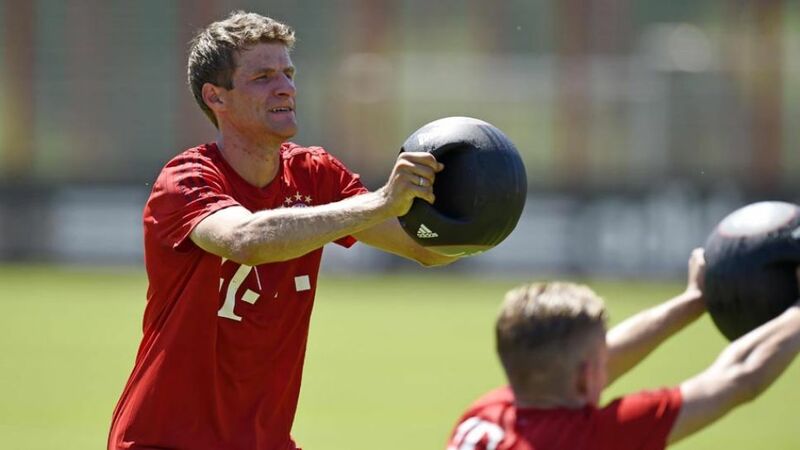 Cologne - Bundesliga sides up and down the country have kicked off pre-season proceedings, with a number of teams having already hit the training ground and others on the cusp of a return to normal daily service ahead of the 2015/16 campaign. 1. FC Köln have just tweeted the below video. "A high quality of passing in the exercises," reads the caption. Franco Di Santo was back at Bremen training today, and clearly pleased about it judging by the exuberance of his Facebook post. Even one of football's coolest customers, Thomas Müller, was forced into taking a drinks break such was the hot weather in Munich today. Anthony Ujah looks (and sounds) raring to go on his first day at Bremen. There's no rest for the Champions League participants as Gladbach did some intense training this afternoon. Champions Bayern, meanwhile, have formally unveiled new goalkeeper Sven Ulreich. ...and doesn't it look nice?! ...after all, the first day of training means the season is drawing closer. "Really important on days like today: the icebath!" Hamburg's stars have also come through the running unscathed and are working with the ball. "After warming up, next on the agenda are some passing exercises," explains the tweet below. Hertha have come through the fitness tests and are onto some work with the ball. "Now the ball's rolling and it's time for some passing work," explains the tweet below. "Sweating in the sun! Augsburg's morning training session underway," reads this tweet from UEFA Europa League participants FC Augsburg. "Training gets underway in 2015/16"
After his squad completed their obligatory fitness tests on Monday, Thomas Tuchel finally took charge of his first Borussia Dortmund training session on Tuesday much to the excitement of the club's fans, star players and Twitter account. Mainz became the latest side to return to pre-season training. The 05ers will be looking to build on last season's 11th-placed finish under head coach Martin Schmidt and have several new squad members in tow to help them do just that. Having missed almost the entirety of last season due to a knee injury sustained in the 2014 Super Cup, FC Bayern's Javi Martinez got to work before his colleagues by enjoying a kick-about with children at his personally funded 'Campus de Futbol' kids camps. Capital city outfit Hertha Berlin have completed their first training session of the day, but there's one more still to come at 16:00 CEST. 1. FC Köln are lapping up the sunshine in Burgenland as the pre-season preparations continue in earnest. It appears Borussia Dortmund were pleased to see their new man, Gonzalo Castro, clad in Yellow and Black with the side gearing up for their first ever session under Jürgen Klopp's successor, Thomas Tuchel. 1. FSV Mainz 05 began building towards the upcoming campaign on Monday, but for new signings Danny Latza, Leon Balogun, Florian Niederlechner and Maximilian Beister, today was their first day in action as they got their respective Mainz careers underway with some rigourous fitness tests. Translation: First day on the job for Mainz's new signings: Latza, Balogun, Niederlechner and Beister undergoing performance tests. 1. FC Köln are in Burgenland for the first of their two pre-season training camps. If the video they tweeted is anything to go by they'll be gearing up for the new season in optimal conditions. Translation: Preparations for the 2015/16 season - everything remains different! Borussia Dortmund skipper Mats Hummels is already hard at work preparing for the new campaign. The Germany international and 2014 FIFA World Cup winner will have a new coach to impress in Thomas Tuchel. Alexander Zorninger had new signing Mitch Langerak at his disposal in his first training session as VfB Stuttgart head coach on Monday. After finishing up with the Germany U-21s at the UEFA European Championships in the Czech Republic this week, Johannes Geis had his first day at new club Schalke today. He left Mainz to join the Royal Blues on a four-year deal last week. Over in Mönchengladbach, the Foals resumed training in beaming sunshine with new faces Lars Stindl, Nico Elvedig and Tobias Sippel in tow and cheered on by an impressive 1,000-strong crowd. Halil Altintop and his FC Augsburg colleagues undergo lactate tests on die Fuggerstädter's first day of pre-season training. Newly-promoted FC Ingolstadt 04 had quite the turnout at their first training session as a top-flight outfit. "To have so many fans here at training is simply sensational," said head coach Ralph Hasenhüttl, who had new signings Elias Kachunga and Romain Bregerie on board, while long-term absentee Danny da Costa made his return to first-team affairs. Hertha Berlin also got their pre-season preparations underway on Sunday and all eyes were on one man in particular, summer signing Mitchell Weiser, who joined the capital city side from reigning champions FC Bayern München. 2,000 fans showed up to catch their stars, including Alexander Baumjohann, a victim of two torn ligaments that have seen him miss almost two full seasons, in action. Four teams will be back on the training ground on Monday, with Alexander Zorninger set to take charge for the first time at VfB Stuttgart. Further south FC Bayern München are counting down the days before they get underway on Wednesday. Out to avoid the dreaded second-season syndrome, 1. FC Köln completed the customary fitness tests in their first day back to the normal day-to-day routine of a professional football club. On Sunday they head to Burgenland for their pre-season training camp. Translation: "It’s underway: Our lads are on their way to the start of training. Fantastic reception!" Newly-promoted SV Darmstadt 98 were the first team to return to training less than a month after clinching second place in the second tier and with it promotion to the Bundesliga.